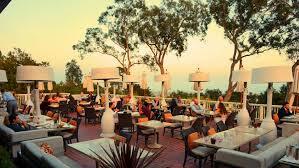 Sunday brunch at Belmond El Encanto in Santa Barbara is a great experience. For just $75 a person, they pour endless cool Bellinis with Moet Champagne, bring you a marvelous giant plate of innovative appetizers for the table to share (shrimp rolls, scallops ceviche, ahi poke, crab Louis, deviled eggs, and smoked salmon included) and all you have to decide is what entree you will have. We chose tender Australian rack of lamb and grilled Branzino…they were done to perfection. We could have had organic chicken and waffle, California black cod, Riviera clam bake, Columbia River wild salmon, black quinoa risotto, grilled new York steak, seared local swordfish, or artisan spaghetti vongole. When you have finished this feast, you are directed to the dessert table which is loaded with scores of the most delicious and beautifully prepared sweets—chocolates, cakes, little fruit and custard tarts, and, of course, their famous floating island. We could nor imagine a more romantic way to spend a Sunday overlooking the cypress trees and sea in the hands of the professional folks at Belmond El Encanto. If that’s not enough, there was live music–imagine, flute serenades carried on the Spring breezes and you have the whole picture. A memory to savor forever.